Former member of Synodical Conference and Lutheran Council—USA. United States, especially in the Upper Midwest. The Lutheran Church–Missouri Synod (LCMS), often referred to simply as the Missouri Synod, is a traditional, confessional Lutheran denomination in the United States. With 2.1 million members, it is both the eighth-largest Protestant denomination and the second-largest Lutheran body in the U.S., the largest being Evangelical Lutheran Church in America. The LCMS was organized in 1847 at a meeting in Chicago, Illinois, as the German Evangelical Lutheran Synod of Missouri, Ohio, and Other States, a name which reflected the geographic locations of the founding congregations. The LCMS is headquartered in Kirkwood, Missouri. The LCMS has congregations in all 50 U.S. states and two Canadian provinces, but over half of its members are located in the Midwest. It is a member of the International Lutheran Council, and is in altar and pulpit fellowship with most of that group's members. The LCMS is divided into 35 districts—33 of which are geographic and two (the English and the SELC) are non-geographic. The current president is the Rev. Matthew C. Harrison, who took office on September 1, 2010. 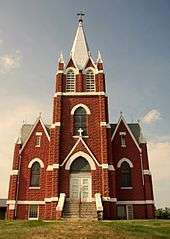 The Missouri Synod emerged from several communities of German Lutheran immigrants during the 1830s and 1840s. In Indiana, Ohio, and Michigan, isolated Germans in the dense forests of the American frontier were brought together and ministered to by missionary F. C. D. Wyneken. A movement of Confessional Lutherans under Martin Stephan created a community in Perry County, Missouri, and St. Louis, Missouri. 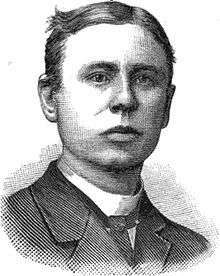 In Michigan and Ohio, missionaries sent by Wilhelm Löhe ministered to scattered congregations and founded German Lutheran communities in Frankenmuth, Michigan, and the Saginaw Valley of Michigan. In the 19th-century German Kingdom of Saxony, Lutheran pastor Martin Stephan and many of his followers found themselves increasingly at odds with the rationalism, Christian ecumenism, and the prospect of a forced unionism of the Lutheran church with the Reformed church. In the neighboring Kingdom of Prussia, the Prussian Union of 1817 put in place what they considered non-Lutheran communion and baptismal doctrine and practice. In order to freely practice their Christian faith in accordance with the Lutheran confessions outlined in the Book of Concord, Stephan and between 600 and 700 other Saxon Lutherans left for the United States in November 1838. Their ships arrived between December 31, 1838, and January 20, 1839, in New Orleans, with one ship lost at sea. Most of the remaining immigrants left almost immediately, with the first group arriving in St. Louis on January 19, 1839. The final group, led by Stephan, remained in New Orleans for ten days, possibly to wait for the passengers of the lost ship Amalia. The immigrants ultimately settled in Perry County, Missouri, and in and around St. Louis. Stephan was initially the bishop of the new settlement, but he soon became embroiled in charges of corruption and sexual misconduct with members of the congregation and was expelled from the settlement, leaving C. F. W. Walther as the leader of the colony. During this period, there was considerable debate within the settlement over the proper status of the church in the New World: whether it was a new church or whether it remained within the Lutheran hierarchy in Germany. Walther's view that they could consider themselves a new church prevailed. St. Paul's in Chicago, where the first meeting of the Missouri Synod was held. Old Lutheran free church leader Friedrich August Brünn sent about 235 men to serve as pastors in the Missouri Synod. On April 26, 1847, twelve pastors representing 14 German Lutheran congregations met in Chicago, Illinois, and founded a new church body, the German Evangelical Lutheran Synod of Missouri, Ohio and Other States. Walther became the fledgling denomination's first president. In its early days, the Synod was conservative on a number of issues. Following Walther's lead, it strongly opposed humanism and religious syncretism. He also advocated practicing church fellowship with only those Lutheran congregations and synods who were in complete doctrinal agreement with the Missouri Synod. Under the leadership of its second president, F. C. D. Wyneken, the Missouri Synod poured much effort into caring for German immigrants, helping them find a home among other Germans, building churches and parochial schools, and providing pastors and teachers to serve in them. As a result, the new Synod grew quickly during the 19th century, reaching 687,000 members by its fiftieth anniversary in 1897. In 1872, it joined the Wisconsin, Ohio, Norwegian, Minnesota, and Illinois Synods, other conservative Lutheran bodies, in forming the Evangelical Lutheran Synodical Conference of North America. As one scholar has explained, "The overwhelming evidence from internal documents of these [Missouri Synod] churches, and particularly their schools... indicates that the German-American school was a bilingual one much (perhaps a whole generation or more) earlier than 1917, and that the majority of the pupils may have been English-dominant bilinguals from the early 1880s on". Until the United States' involvement in the First and Second World Wars, the older members of the Synod remained overwhelmingly German in their language, but younger members had increasingly switched to English. The anti-German sentiment during the wars hastened the "Americanization" of the church and caused many churches to add English services and in some cases, drop German services entirely. During the years of language transition, the Synod's membership continued to grow, until by 1947, the Synod had grown to over 1.5 million members. In 1947, the church body shortened its name from "Evangelical Lutheran Synod of Missouri, Ohio, and other States" to the present one, the Lutheran Church–Missouri Synod. On January 1, 1964, the National Evangelical Lutheran Church, an historically Finnish-American Lutheran church, merged with the LCMS. In 1971, the Synod of Evangelical Lutheran Churches, an historically Slovak-American church, also merged with the LCMS, forming the SELC District. Beginning in the 1950s, the LCMS became somewhat friendlier to the more liberal Lutheran bodies, despite the opposition of the other members of the Synodical Conference. This culminated in the break up of the Synodical Conference in 1963. 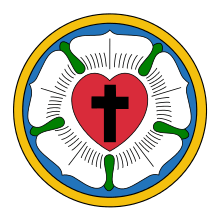 Six years later, the LCMS formed the Lutheran Council in the United States of America (LCUSA) with several moderate-to-liberal Lutheran bodies. However, with the election of J. A. O. Preus II as its president in 1969, the LCMS began a sharp turn towards a more conservative direction. A dispute over the use of the historical-critical method for Biblical interpretation led to the suspension of John Tietjen as president of Concordia Seminary; in response many of the faculty and students left the seminary and formed Seminex (Concordia Seminary in Exile), which took up residence at the nearby Eden Theological Seminary in suburban St. Louis. In 1976 about 250 of the congregations supporting Seminex left the Synod to form the Association of Evangelical Lutheran Churches, which became part of the Evangelical Lutheran Church in America in 1988. The LCMS pulled out of LCUSA shortly after the AELC schism, only a few years after the organization's formation. The entire controversy marked an instance of a conservative religious body resisting theological change rather than incorporating its tenets, something relatively rare among American religious bodies, with the only other analogous scenario being the fundamentalist resurgence in the Southern Baptist Convention from the late 1970s to the early 1990s. The LCMS also oversaw an extensive roster of congregations in Canada until 1988, when the Canadian component became a separate and autonomous organization, Lutheran Church-Canada. However, this was an administrative and not theological division and the two groups still share close ties. A small number of Ontario and Quebec churches remain within the LCMS. One of the signature teachings of the Lutheran Reformation is the teaching named Sola scriptura—"Scripture alone." The Missouri Synod believes that the Bible is the only standard by which church teachings can be judged. It also holds that Scripture is explained and interpreted by the Book of Concord —a series of confessions of faith composed by Lutherans in the 16th century. Missouri Synod pastors and congregations agree to teach in harmony with the Book of Concord because it teaches and faithfully explains the Word of God, not based on its own authority alone. Since the Missouri Synod is a confessional church body, its ordained and commissioned ministers of religion are sworn by their oaths of ordination or installation, or both, to interpret the Sacred Scriptures according to the Book of Concord. Its ordained and commissioned ministers of religion are asked to honor and uphold other official teachings of the Synod, meaning "to abide by, act, and teach in accordance with," but are not sworn to believe, confess and teach them as correct interpretations of the Sacred Scriptures. The Missouri Synod also teaches biblical inerrancy, the teaching that Bible is inspired by God and is without error. For this reason, they reject much—if not all—of modern liberal scholarship. Franz August Otto Pieper's Brief Statement of the Doctrinal Position of the Missouri Synod provides a summary of the major beliefs of the LCMS. The Missouri Synod believes that justification comes from God "by divine grace alone, through faith alone, on account of Christ alone." It teaches that Jesus is the focus of the entire Bible and that faith in him alone is the way to eternal salvation. The synod rejects any attempt to attribute salvation to anything other than Christ's death and resurrection. The synod teaches that the Word of God, both written and preached, and the Sacraments are means of grace through which the Holy Spirit gives the gift of God's grace, creates faith in the hearts of individuals, forgives sins for the sake of Christ's death on the cross, and grants eternal life and salvation. Many Missouri Synod Lutherans define a sacrament as an action instituted by Jesus that combines a promise in God's Word with a physical element, although the synod holds no official definition for sacrament. This means that some may disagree on the number of sacraments. All agree that Baptism and Communion are sacraments. Confession and absolution is called a sacrament in the Apology of the Augsburg Confession and so is also considered by many Lutherans to be a sacrament, because it was instituted by Christ and has His promise of grace, even though it is not tied to a physical element. Unlike Calvinists, Lutherans agree that the means of grace are resistible; this belief is based on numerous biblical references as discussed in the Book of Concord. Regarding the Eucharist, the LCMS rejects both the Roman Catholic doctrine of transubstantiation and the Reformed teaching that the true body and blood of Christ are not consumed with the consecrated bread and wine in the Eucharist. Rather, it believes in the doctrine of the sacramental union, Real Presence, that the Body and Blood of Christ are truly present "in, with, and under" the elements of bread and wine. Or, as the Smalcald Articles express this mystery: "Of the Sacrament of the Altar, we hold that the bread and wine in the Supper are Christ's true body and blood." It is occasionally reported that the LCMS and other Lutherans teach the doctrine of consubstantiation. Consubstantiation is generally rejected by Lutherans and is explicitly rejected by the LCMS as an attempt to define the holy mystery of Christ's presence. The Missouri Synod flatly rejects millennialism and considers itself amillennialist. This means that they believe there will be no literal 1000-year visible earthly kingdom of Jesus, a view termed as "realized millennialism" in which the "thousand years" of Rev 20:1–10 is taken figuratively as a reference to the time of Christ's reign as king from the day of his ascension. Hence, the millennium is a present reality (Christ's heavenly reign), not a future hope for a rule of Christ on earth after his return (the parousia) (cf. Mt 13:41–42; Mt 28:18; Eph 2:6; Col 3:1–3). The LCMS believes that the Holy Scriptures contain only two teachings—the Law and the Gospel. The Law is all those demands in the Bible which must be obeyed in order to gain salvation. However, because all people are sinners, it is impossible for people to completely obey the Law. Therefore, the Law implies an inevitable consequence of God's wrath, judgment, and damnation. The Gospel, on the other hand, is the promise of free salvation from God to sinners. The Law condemns; the Gospel saves. Both the Law and the Gospel are gifts from God; both are necessary. The function of the law is to show people their sinful nature and drive them to the Gospel, in which the forgiveness of sin is promised for the sake of the death and resurrection of Jesus Christ. The LCMS holds that the Old Testament and the New Testament both contain both Law and Gospel. The Old Testament, therefore, is valuable to Christians. Its teachings point forward in time to the Cross of Christ in the same way that the New Testament points backward in time to the Cross. This Lutheran doctrine was summarized by C. F. W. Walther in The Proper Distinction Between Law and Gospel. The LCMS holds that all "false teachers who teach contrary to Christ's Word are opponents of Christ" and, insofar as they do so, are anti-Christ. The LCMS does not teach, nor has it ever taught, that any individual pope as a person is to be identified with the Antichrist. However, to the extent that the papacy continues to claim as official dogma the canons and decrees of the Council of Trent, the LCMS position is that the office of the papacy is the Antichrist. The LCMS officially supports literal creationism but does not have an official position on the precise age of the earth. An official publication of the synod, the well known "Brief Statement of 1932," states under the heading "Of Creation": "We teach that God has created heaven and earth, and that in the manner and in the space of time recorded in the Holy Scriptures, especially Gen. 1 and 2, namely, by His almighty creative word, and in six days." According to the recent 2004 LCMS synodical resolution 2-08A "To commend preaching and teaching Creation," all LCMS churches and educational institutions—including preschool through 12th grade, universities, and seminaries—are "to teach creation from the Biblical perspective." The LCMS website states that an individual's personal views regarding creation do not disqualify a person from being a member of the LCMS. The LCMS practices infant baptism, based on Acts 2:38–39 and other passages of Scripture. It also subscribes to the statement of faith found in the Apostles' Creed, the Ten Commandments and the Lord's Prayer to be applicable to daily life. These doctrines are emphasized in Luther's Small Catechism. The Missouri Synod's original constitution stated that one of its purposes is to strive toward uniformity in practice, while more recent changes to those documents also encourage responsible and doctrinally sound diversity. The synod requires that hymns, songs, liturgies, and practices be in harmony with the Bible and Book of Concord. Worship in Missouri Synod congregations is generally thought of as orthodox and liturgical, utilizing a printed order of service and hymnal, and is typically accompanied by a pipe organ or piano. The contents of LCMS hymnals from the past, such as The Lutheran Hymnal and Lutheran Worship, and those of its newest hymnal, Lutheran Service Book, highlight the synod's unwavering stance towards more traditional styles of hymnody and liturgy. More traditional LCMS Lutherans point to the Lutheran Confessions in their defense of liturgical worship. Towards the later parts of the twentieth century and up until present day, some congregations have adopted a more progressive style of worship, employing different styles such as contemporary Christian music with guitars and praise bands and often display song lyrics onto screens instead of using hymnals. While this shift in style challenges the traditionalism of hymnody that the LCMS holds strongly, the LCMS has released a statement on worship admitting that, "The best of musical traditions, both ancient and modern, are embraced by the Lutheran church in its worship, with an emphasis on congregational singing, reinforced by the choir." The LCMS endorses the doctrine of close or closed communion—the policy of sharing the Eucharist ordinarily only with those who are baptized and confirmed members of one of the congregations of the Lutheran Church–Missouri Synod or of a congregation of one of its sister churches with which it has formally declared altar and pulpit fellowship (i.e., agreement in all articles of doctrine). Missouri Synod congregations implement closed communion in various ways, requiring conformity to official doctrine in various degrees. Usually, visitors are asked to speak with the pastor before coming to that congregation's altar for the first time. Most congregations invite those uneducated on the subject of the Eucharist to join in the fellowship and receive a blessing instead of the body and blood of Christ. This is because, as Bonhoeffer emphasizes in his book Life Together, Christ comes to us and sustains us through community. Some congregations, however, do not implement the synod's policy, celebrating open communion and welcoming all to their altars. The existence of such divergent practice of doctrine challenges the unity of the LCMS. Ordination is seen as a public ceremony of recognition that a man has received and accepted a divine call, and hence is considered to be in the office of the public ministry. The Treatise on the Power and Primacy of the Pope agrees that "ordination was nothing else than such a ratification" of local elections by the people. The LCMS does not believe ordination is divinely instituted or an extension of an episcopal form of apostolic succession but sees the office grounded in the Word and Sacrament ministry of the Gospel, arguing that Scripture makes no distinction between a presbyter (priest) and a bishop (see Treatise on the Power and Primacy of the Pope, paragraphs 63,64, citing St. Jerome). The Augsburg Confession (Article XIV) holds that no one is to preach, teach, or administer the sacraments without a regular call. LCMS pastors are generally required to have a four-year bachelor's degree (in any discipline), as well as a four-year Master of Divinity degree, which is usually obtained from one of these institutions: Concordia Seminary in St. Louis or the Concordia Theological Seminary in Fort Wayne, Indiana or at the two seminaries run by the Lutheran Church–Canada. Candidates may earn their Master of Divinity degree at other seminaries but may then be required to take colloquy classes at either St. Louis or Ft. Wayne. Seminary training includes classwork in historical theology, Biblical languages (Biblical Greek and Hebrew), practical application (education, preaching, and mission), and doctrine (the basic teachings and beliefs of the synod). The Missouri Synod teaches that the ordination of women as clergy is contrary to scripture. The issue of women's roles in the church body has continued to be a subject of debate within the synod. During the Cooperative Clergy Study Project in the year 2000, 10% out of 652 LCMS pastors surveyed stated that all clergy positions should be open to women, while 82% disagreed. Congregations were permitted to enact female suffrage within Missouri Synod congregations in 1969, and it was affirmed at the Synod's 2004 convention that women may also "serve in humanly established offices" as long as those offices do not include any of the "distinctive functions of the pastoral office." Thus in many congregations of the LCMS, women now serve as congregation president or chairperson, etc. This is the cause of contention within the LCMS, with some congregations utilizing women in public worship to read lessons and assist in the distribution of holy communion. Other traditional Lutherans reject such practices as unbiblical, with a minority of congregations continuing the historic practice of male suffrage, similar to the Wisconsin Synod. The National Youth Gathering is held every three years. The most recent gathering took place from July 16–20, 2016, in New Orleans, Louisiana. The theme for the 2016 gathering was "In Christ Alone." The previous gathering took place in 2013 in San Antonio, Texas from July 1–5, 2013. It was based on the theme, "Live Love(d)." The 2010 gathering in New Orleans was based on the theme "We Believe". In both 2007 and 2004, The LCMS National Youth Gatherings were held at the Orange County Convention Center in Orlando, Florida. The gathering's theme in 2007 was "Chosen." The gathering in 2007 was originally planned to be held in New Orleans, Louisiana, but due to Hurricane Katrina, the location was changed to Orlando, Florida. Around 25,000 youth attend each gathering. Many Christian bands and artists perform at gatherings. The LCMS has a modified form of congregational polity. This is different from some other Lutheran bodies which have maintained episcopal polity; however, this is not considered to be a point of doctrine, as the Synod is in fellowship with some Lutheran church bodies in Europe that have an episcopal structure. The LCMS as a whole is led by an ordained Synodical President, currently the Rev. Dr. Matthew C. Harrison. The President is chosen at a synodical convention, a gathering of the two membership groups (professional clergymen and lay representatives from the member congregations). The convention is held every three years; discussions of doctrine and policy take place at these events, and elections are held to fill various Synod positions. The next Synod convention will be in 2016. Local conventions within each circuit and district are held in the intervening years. The entire synod is divided into districts, usually corresponding to a specific geographic area, as well as two non-geographical districts, the English and the SELC, which were formed when the formerly separate English Missouri Synod and the Slovak Synod, respectively, merged with the formerly German-speaking Missouri Synod. Each district is led by an elected district president, who must be an ordained clergyman. Most district presidencies are full-time positions, but there are a few exceptions in which the district president also serves as a parish pastor. The districts are subdivided into circuits, each of which is led by a circuit counselor, who is an ordained pastor from one of the member congregations. Districts are roughly analogous to dioceses in other Christian communities. Congregations are served by full-time professional clergy. The LCMS is congregationalist with regard to polity. In addition to its two seminaries, the LCMS operates ten universities, known as the Concordia University System. Among the LCMS's other auxiliary organizations are the Lutheran Laymen's League (now known as Lutheran Hour Ministries), which conducts outreach ministries including The Lutheran Hour radio program; and the Lutheran Women's Missionary League. The synod also operates Concordia Publishing House, through which it publishes the official periodical of the LCMS, The Lutheran Witness. Maintaining its position as a confessional church body emphasizing the importance of full agreement in the teachings of the Bible, the LCMS is not associated with ecumenical organizations such as the National Council of Churches, the National Association of Evangelicals, the World Council of Churches or the Lutheran World Federation. It is, however, a member of the International Lutheran Council, made up of over 30 Lutheran churches worldwide that support the confessional doctrines of the Bible and the Book of Concord. At the 2007 convention, the delegates voted to establish altar and pulpit fellowship with the American Association of Lutheran Churches (AALC). Although its strongly conservative views on theology and ethics might seem to make the LCMS politically compatible with Protestant evangelicals and fundamentalists in the U.S., the LCMS largely eschews political activity, partly out of concerns to keep the denomination untainted with potential heresies and also because of its strict understanding of the Lutheran distinction between the Two Kingdoms (see above), which repudiates the primarily Calvinist presuppositions about the totalizing rule of God that informs much, if not most, of U.S. evangelical understanding of politics and Christianity. However, both LCMS and Evangelicals share the common belief that life begins and should be protected by law since conception. The biblical understanding of fellowship: the LCMS believes in a distinction between the altar, pulpit fellowship, and other manifestations of Christian fellowship (i.e., a prayer fellowship). The WELS does not. The doctrine of the ministry: the LCMS believes that the Pastoral office is divinely established, but all other offices are human institutions and hence are not divinely established. The WELS believes that the Ministry of the Word is divinely established and that congregations and the synod may choose the forms of public ministry they wish to use. The role of women in the church: Although both the LCMS and WELS agree that Scripture reserves the pastoral office for men, the WELS also believes that Scripture forbids women's suffrage in the congregation. Membership growth was substantial in the first half of the 20th century. According to the Yearbook of American & Canadian Churches, the LCMS had 628,695 members in 1925. By 1950 the number of members had grown to over 1.6 million. Membership peaked in 1970 at just under 2.8 million. In 2015 the LCMS reported 2,097,258 members and 6,105 churches, with 6,094 active clergy. LCMS membership continues to be concentrated in the Upper Midwest. The five states with the highest rates of adherence are Nebraska, Wisconsin, South Dakota, Minnesota, and Iowa. Matthew C. Harrison is the current president of the Missouri Synod. The LCMS bars its clergy from worshiping with other faiths, holding "that church fellowship or merger between church bodies in doctrinal disagreement with one another is not in keeping with what the Bible teaches about church fellowship." In practice of this, a Connecticut LCMS pastor was asked to apologize by the president of the denomination, and did so, for participating in an interfaith prayer vigil for the 26 children and adults killed at a Newtown elementary school, and a LCMS pastor in New York was suspended for praying at an interfaith vigil in 2001, 12 days after the September 11 attacks. 1 2 3 "LCMS congregations report statistics for 2014". Lutheran Church–Missouri Synod. Retrieved October 31, 2015. ↑ Kieschnick, Jerry (November 2007). "Worldwide Partners in the Gospel". The Lutheran Witness. Retrieved 29 January 2012. ↑ Lueker, Erwin L. (1965). 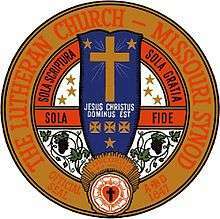 "Lutheran Church—Missouri Synod". In Bodensieck, Julius. The Encyclopedia of the Lutheran Church. 2. Augsburg Publishing House. pp. 1408–1409. ↑ Baepler, Walter A., A Century of Grace: A History of the Missouri Synod, 1847-1947 (St. Louis: Concordia Publishing House, 1947), 9-12. ↑ Forster, Walter O., Zion on the Mississippi (St. Louis: Concordia Publishing House, 1953), 199f. ↑ Baepler, 28; Forster, 202-217. ↑ Mezger, George. Denkstein zum fünfundsiebzigjährigen Jubiläum der Missourisynode, 1847–1922. Concordia. St. Louis: 1922. ↑ "Lutheran Church - Missouri Synod - Christian Cyclopedia". Brunn, Friedrich August. ↑ C. Dreyer. "Infidelity in the Church." Lutheran Witness 1 No. 6:52; G. Johannes, "The Danger of Atheistic Writings," Lutheran Witness 1 No. 13:100; "Universalism as defined by a Universalist," Lutheran Witness July 21, 1888. ↑ J.C. Oehlschlaeger. "Idolatry," Lutheran Witness 1 No. 6:43. ↑ Schiffman, Harold (1987). "Language loyalty in the German-American Church: the Case of an Over-confident Minority". ↑ Erwin L. Lueker; Luther Poellot; Paul Jackson (eds.). "Finnish Lutherans in America". Christian Cyclopedia. Retrieved May 21, 2016. ↑ "About Us". SELC District of the LCMS. Retrieved May 21, 2016. ↑ Constitution of the Lutheran Church MIssouri Synod, 2010 edition, Article II Confession, p. 13, and Article V Membership, p. 14. ↑ The Bylaws of the Lutheran Church Missouri Synod, 2010 edition, Doctrinal Resolutions and Statements, 1.6.2. (7), p. 39. ↑ Smalcald Articles, Concordia: The Lutheran Confessions (St. Louis: Concordia Publishing House, 2005), 305. ↑ Francis Pieper, Christian Dogmatics (St. Louis:Concordia Publishing House, 1953), 3:326–27 and John Theodore Mueller, Christian Dogmatics (St. Louis: Concordia Publishing House, 1934), 519–20, 528. ↑ [http://cyclopedia.lcms.org/display.asp?t1=p&word=PAROUSIA%7c[Christian "Lutheran Church - Missouri Synod - Christian Cyclopedia"]. Parousia. ↑ Nafzger, Samuel H. (2009). "An Introduction to the Lutheran Church–Missouri Synod" (PDF). www.lcms.org. Concordia Publishing House. p. 12. Retrieved September 22, 2014. ↑ Harrison, Matthew (May 2014). "Back to Basics: Law and Gospel". The Lutheran Witness. Concordia Publishing House. 133 (5): 1. ISSN 0024-757X. Retrieved September 22, 2014. ↑ Creation and Evolution, Lutheran Church-Missouri Synod, by Dr. A.L. Barry. ↑ Of Creation, A Brief Statement of the Doctrinal Position of the Missouri Synod, Adopted 1932. ↑ "LCMS Frequently Asked Questions". ↑ Christian Cyclopedia s.v. "Close Communion." (St. Louis:Concordia Publishing House; Lutheran Church–Missouri Synod, 2000, 2006). ↑ "Treatise on the Power and Primacy of the Pope - Book of Concord". paragraph 70. ↑ "Summary - The Cooperative Clergy Study Project - Data Archive - The Association of Religion Data Archives". ↑ U.S. Religious Landscape Survey: Religious Beliefs and Practices, Diverse and Politically Relevant. Washington D.C.: Pew Forum on Religion and Public Life. June 2008. Accessed online on September 27, 2009 at http://religions.pewforum.org/pdf/report2-religious-landscape-study-full.pdf. ↑ "Historic Archive CD and Yearbook of American & Canadian Churches". The National Council of Churches. Retrieved 2009-12-04. ↑ "2000 Religious Congregations and Membership Study". Glenmary Research Center. Retrieved 2009-12-04. ↑ Lipka, Michael (July 27, 2015). "The most and least racially diverse U.S. religious groups". Pew Research Center. Retrieved July 27, 2015. ↑ U.S. Religious Landscape Survey: Religious Beliefs and Practices, Diverse and Politically Relevant: Detailed Data Tables. Washington D.C.: Pew Forum on Religion and Public Life. June 2008. Accessed online on November 21, 2009 at http://religions.pewforum.org/reports/detailed_tables. ↑ "Lutheran Church-Missouri Synod (LCMS)". American Denomination Profles. Association of Religion Data Archives. Retrieved April 16, 2014. ↑ "Brief Statement of the Doctrinal Position of the Missouri Synod". Concordia Publishing House. 1932. Retrieved 28 February 2013. ↑ "Pastor apologizes for role in prayer vigil after Connecticut massacre". Reuters. 2013. Retrieved 7 February 2013. Baepler, Walter A. A Century of Grace: A History of the Missouri Synod, 1847-1947. St. Louis: Concordia Publishing House, 1947. Dau, W. H. T., ed. Ebenezer: Reviews of the Work of the Missouri Synod during Three Quarters of a Century. St. Louis: Concordia Publishing House, 1922. Forster, Walter O. Zion on the Mississippi: The Settlement of the Saxon Lutherans in Missouri 1839–1841. St. Louis: Concordia Publishing House, 1953. Graebner, August Lawrence. Half a Century of Sound Lutheranism in America: A Brief Sketch of the History of the Missouri Synod St. Louis: Concordia Publishing House, 1893. Polack, W. G. The Building of a Great Church: A Brief History of the Lutheran Church in America. St. Louis: Concordia Publishing House, 1941. Schieferdecker, G.A. History of the First German Lutheran Settlement in Altenburg, Perry County, Missouri with Special Emphasis on its Ecclesiastic Movements. Clayton, Iowa: Wartburg Seminary, 1865. Schmidtz, F. The Destinies and Adventures of the Stephanists who emigrated from Saxony to America Dresden: C. Heinrich, 1839. Adams, James E. Preus of Missouri and the Great Lutheran Civil War. New York: Harper and Row, 1977. Board of Control, Concordia Seminary. Exodus From Concordia: A Report on the 1974 Walkout. St. Louis: Concordia Seminary, 1977. Marquart, Kurt E. Anatomy of an Explosion: Missouri in Lutheran Perspective. Fort Wayne, IN: Concordia Theological Seminary Press, 1977. Tietjen, John. Memoirs in Exile: Confessional Hope and Institutional Conflict. Minneapolis: Augsburg Fortress Press, 1990. Zimmerman, Paul. A Seminary in Crisis. St. Louis: Concordia Publishing House, 2006. Gieseler, Carl A. The Wide-Open Island City: Home Mission Work in a Big City. St. Louis: Concordia Publishing House, 1927. Kretzmann, Paul E. Glimpses of the Lives of Great Missionary Women. Men and Missions IX. St. Louis: Concordia Publishing House, 1930. Krueger, Ottomar. "Unto the Uttermost Part of the Earth": The Life of Pastor Louis Harms. Men and Missions VIII. St. Louis: Concordia Publishing House, 1930. Our China Mission. Men and Missions IV. St. Louis: Concordia Publishing House, 1926. Synodal-Handbuch der deutschen ev.-luth. Synode von Missouri, Ohio u. a. St. . St. Louis: Lutherischer Concordia-Verlag, 1879. Synodal-Handbuch der deutschen ev.-luth. Synode von Missouri, Ohio u. a. St. . St. Louis: Luth. Concordia-Verlag, 1888. Kirchen-gesangbuch für Evang-lutherische Gemeinden ungeänderter augsburgischer Confession. St. Louis: Verlag der ev.-luth. Synode von Missouri, Ohio u.a. Staaten, 1868. Vehse, Carl Eduard. Die Stephan'sche Auswanderung nach Amerika. Dresden: Verlagsexpedition des Dresdner Wochenblattes, 1840. Wikimedia Commons has media related to Lutheran Church-Missouri Synod. Synodical Conference Breakup; A collection of synodical documents from the 1950s to the 1960s.